as well as other partner companies. click for more info on the history of DVD-RAM technology. DVD-RAM can be used very differently from how DVD-R/RW & DVD+R/RW are used, DVD-RAM drives allow you to use the optical media in the same way as a normal hard drive... initializing(formatting) and copying on drag + drop....rather then burning only once.they may be used exactly as one would use a floppy disk or hard disk. the "DVD Multirecorder" specification requires that the drive reads and writes DVD-ROM, DVD-R, DVD-RW & DVD-RAM discs. Be aware that DVD Multi does not mean the devices will accommodate DVD-RAM cartridges or 8 cm discs. 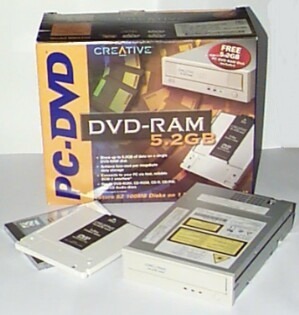 A DVD RAM uses a type of technology known as phase change on the physical disc to store the data. The disc has a special layer of material made from a mixture of metals which is highly responsive to heat. When the laser makes contact with it, one temperature will cause the alloy to be crystalline, while a higher temperature will turn it amorphous. Thus, it is possible to record binary data onto the disc for playback, and to erase the data and write over it later. If cared for properly, a DVD RAM is estimated to be able to last up to 30 years, and through at least 1,000 rewrites. The write speed for a DVD RAM is fairly high, and very accurate thanks to high quality disc defect management. They are frequently used in camcorders and digital cameras to house a high volume of data which can be transferred to another medium before the disc is overwritten. If a computer user wants a highly flexible backup system which is capable of being rewritten numerous times, a DVD RAM is an excellent choice. Long life — without physical damage, data is retained for an estimated 30 years. For this reason, it is used for archival storage of data. Reliable writing of discs. Verification done in hardware by the drive, so post-write verification by software is unnecessary. Software verification is disabled in all current DVD Video Recorders. Disc defect management designed to safeguard data. DVD-burning software may not be required — discs can be used and accessed like a removable hard disk. Mac OS (8.6 or later) uses DVD-RAM directly. Windows XP uses DVD-RAM directly for FAT32-formatted discs only. Windows Vista is able to write directly to both FAT32- and UDF-formatted DVD-RAM discs from within Windows Explorer. Device drivers or other software are needed for earlier versions of Windows. Very fast access of small files on the disc. Small 2 KB disc block size wastes less space when writing small files. Finalization not necessary. For video recording use, other media such as DVD+RW (when used in DVD+VR mode) do not require a separate finalisation either as finalisation is automatic. The table of contents can be overwritten in this latter media. Media available with or without protective cartridges; can be used in the cartridge by many devices. In some video recorders DVD-RAM can be written to and read at the same time, allowing one program to be recorded and a different one, or an earlier part of the same one (time slip recording), to be viewed at the same time. DVD+RW recorders can achieve the same thing, and more recently some DVD-RW recorders achieve it as well (though only at the slower recording speeds). Usable with some high-end security digital video recorders, such as the Tecton Darlex, as a secure and long-lasting export medium. Holds more data when using Double Sided discs than dual-layer DVD+RW and DVD-RW - 9.4GB for DVD-RAM vs 8.5GB for DVD+RW DL and DVD-RW DL. Has write-protect tabs to prevent accidental deletion when used in a cartridge. High-speed media unavailability: 12x media is not available in the U.S., nor Europe, even though 12x drives are readily available, and 16x media may not be available anywhere except manufacturers' R&D laboratories. A hazard exists with 16x RAM2 discs in non-RAM2 drives: the disc may be ejected while spinning. Either way it is not a problem of DVD-RAM media, but the drives that do not recognize them properly. Less compatibility than DVD+RW and DVD-RW, despite predating both formats (as noted above). In addition to most disadvantages of CD/DVD-shaped optical discs. What is a MULTI Drive? Simply put, it is a SuperDrive with the additional feature of being able to read and write to DVD-RAM discs. The MCE DVD-R/RW/RAM Drive for the iBook G4 utilizes 4.7GB single-sided and 9.4GB double-sided rewritable industry standard discs and can record to DVD-RAM / DVD-R / DVD-RW / DVD+R / DVD+RW / CD-R / CD-RW media, and provide superior performance and reliability. Fully compliant with the DVD Forum's standards, the single-sided media is capable of storing a full two-hours of MPEG2 video. MCE's DVD MULTI Drive for the iBook G4 offers unprecedented media interchangeability and seven times the capacity of CD-R and CD-RW. The MCE DVD MULTI drive reads industry-standard DVD-ROM, DVD-Video, DVD-R, CD-ROM, CD-R/RW, CD-DA, Photo CD, and Video CD media. The random-access, drag-and-drop DVD-RAM storage media provides in excess of 100,000 write/rewrite cycles and data life in excess of 30 years.